When optimizing a web page one of the most important SEO tasks is good keyword research. There are many paid for keyword research SEO tools that are awesome, but many new to SEO or businesses that just don’t have the funds available for paid SEO tools have to rely on free keyword research tools. Below I’ll be reviewing the free Google AdWords Keyword Planner Tool, designed for Google’s AdWords users (paying advertisers) to determine how much specific ad campaigns will cost etc… Even though Google AdWords advertising is a paid advertising program, it’s free to join and you can use the AdWords keyword planner for free. Also take a read of the Übersuggest Keyword Research Tool Review another free SEO tool. 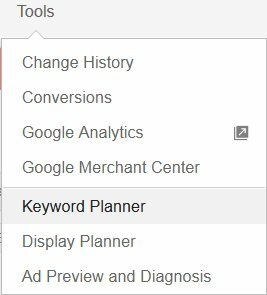 Log into your free Google AdWords account if new to AdWords you can’t use the free keyword planner until you’ve created an ad campaign (it’s free), after you’ve setup an AdWords campaign you’ll have access to the free keywords planner tool. Select the first option: Search for new keyword and ad group ideas and a form opens for adding keywords, I’m going to add the phrase “SEO Tools”. After adding your keywords click the “Get Ideas” button and within the new window you’ll start to see useful SEO data. As you can see from the screenshot above we have quite a lot of useful SEO data regarding the keywords SEO Tools. In the screenshot I’m hovering over “Online SEO” and the tooltip shows what the breakdown is for Google searches related to Online SEO. As you can see there’s 24 derivative SERPs and the Google AdWords Tool estimates only 4,520 monthly searches. That means if you target all 24 “Online SEO” relevant phrases and ranked high for all of them, there’s not that much traffic available. 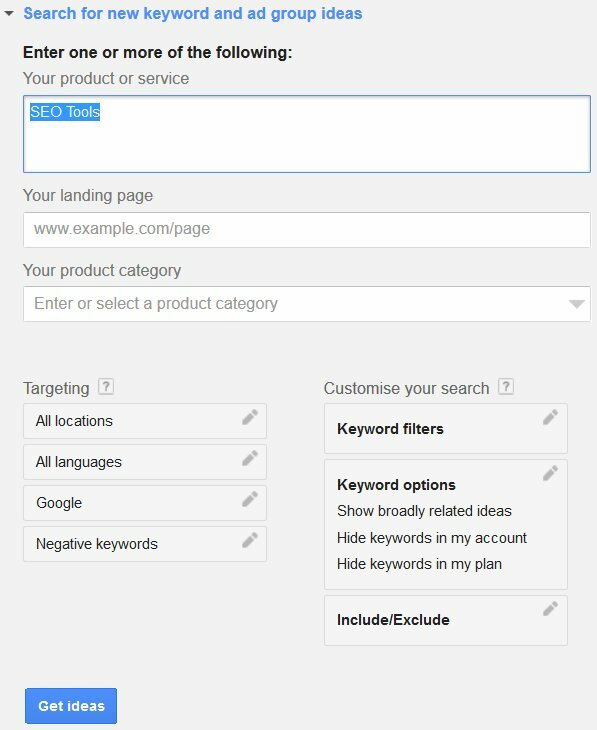 Before we delve deeper into how to use this keyword research data for targeting the best SERPs remember this is a tool for AdWords advertisers, not webmasters looking to increase their Google traffic. For example the competitiveness data isn’t that useful to us, this is competitiveness for ad advertiser, NOT for actual searches, so in itself competitiveness doesn’t indicate how hard it will be for you to gain these SERPs, only how many advertisers are interested in paying money for AdSense ads to load for this SERP. 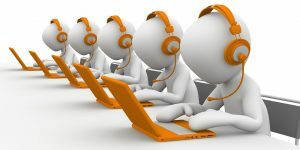 Now if you are looking to make money from your site via AdSense this and the Suggested Bid AdWords data is invaluable. For a Made for AdSense site (MFA sites are just for making money from AdSense clicks) I’d rather have the lower traffic keyword phrases related to “SEO Website” with 8,740 monthly searches (see the screenshot) that the suggested bid is £3.54 than the “Keywords like: Iweb SEO Tool” with twice as much monthly traffic, but half the suggested bid at £1.86. On the other hand if I’m trying to sell an SEO service the higher traffic SERPs are more appealing (ignoring the actual keywords) because it’s not about how much an AdWords advertiser is willing to pay for an AdSense click. 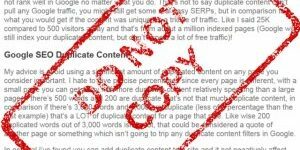 Obviously you ideally want both SERPs sets, but keep the above in mind when deciding which keyword phrases you use from this tool, really does depend on what your site targets. I find it helpful to organize the results by Average Monthly Searches by clicking the “Avg Monthly Searches” column. I then look down the column for the best fit for the article I’m writing. I used these keyphrases as my starting point. You can see the headers (one H1, one H2 and several H3) has a general theme targeting keyword planner, same for image file names and alt text: this is basic on page SEO 101. 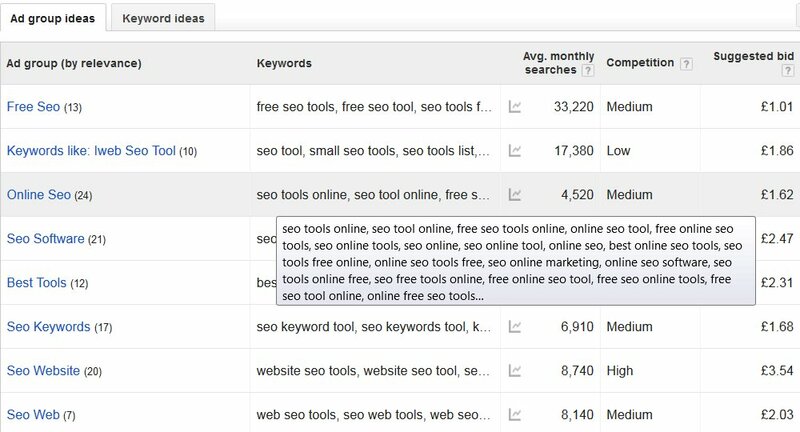 The old Keyword Tool SERPs has significantly more traffic for now at 28,300 and will cover other keyword research tools. However, the keyword planner SERPs are a growing SERP, as you can see from the graph below (part of the AdWords tool results) in November 2013 it had over 8,000 searches up from pretty much none from before July 2013. Those SERPs not only have the potential for future growth, but because Google AdWords renamed their tool less than a year ago the actual web pages competing for these SERPs are going to be far lower than the old AdWords Keyword Tool SERPs. Might make it easier for my new article to compete, would rather have a few thousand visitors a month from easy SERPs than no visitors because an article is targeting harder SERPs (can always create another article to target the more competitive SERPs). So don’t only rely on monthly searches, go check out the competition, it’s about gaining relevant traffic which might be lots of long tail keyphrases, not targeting the hardest SERPs and hoping for the best. There’s a lot more SEO data the AdWords tool can provide, but the above is a very good start. The AdWords keyword research is for advertisers, not web publishers for SEO keyword research. Low competition = low volume for ads to be shown and cheap ads. High competition = high volume of ads and higher CPC. High CPC is what we want for our sites, but not if you are an AdWords advertiser user. Low competition = good for webmasters because it is easy to rank in Google for. High competition = not easy to rank in Google, but this is because you are watching it as a webmaster, not as an advertiser. Unless you are going 100% for AdSense monetization (MFA site), you shouldn’t check the AdWords competition results. Just follow Market Samurai research.